The Weight Watcher: Weigh in - Week 2 - Success! Despite really doing my best to stick to the plan, I am plagued by weigh in nightmares... quite literally! Maybe it's nerves, or even the feeling like I'm not on a diet, but my weekend dreamings are filled with thoughts of weight gains. Luckily, my fears weren't well founded. This week I registered a 2lb loss, earning me my first 1/2 stone lost certificate and entry into the next stone bracket. 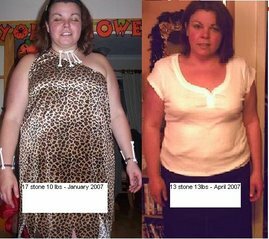 So I'm in the 19stones no more - officially :) Since joining SW two weeks ago I've lost 8lbs - which is much better than I first thought. Thighs are 1 inch smaller - each! I must admit that even I - the total skeptic - am impressed. With changes like that it isn't just water weight and - more importantly - this is a reminder that every pound really counts! Have you measured yourself today? You just might be surprised!